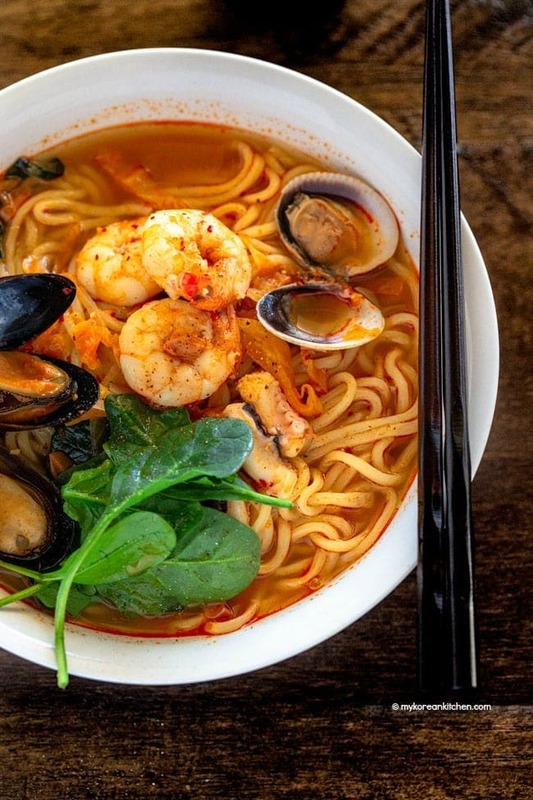 Jjamppong / Jjampong (짬뽕) is a popular Korean spicy noodle soup that is loaded with various type of seafood. It tastes very refreshing and comforting! 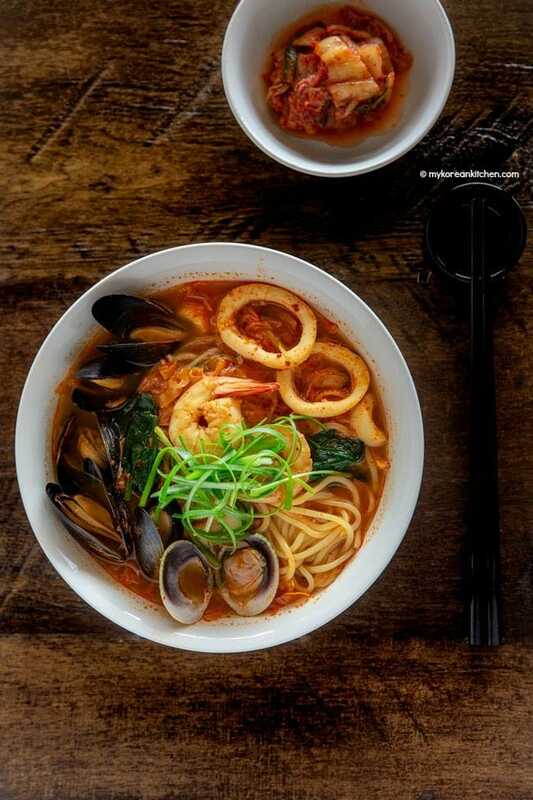 Every now and then I have a craving for Jjamppong (Korean spicy seafood noodle soup). Fiery looking red hot soup can be intimidating to some people, but I have to say, the soup is very addictive, refreshing and comforting! Jjamppong (or Jjampong, 짬뽕) is one of the most popular dishes you can order from a Korean-Chinese restaurant. Jjamppong consists of fresh noodles, various vegetables and various seafoods and it is served in a red hot soup base. 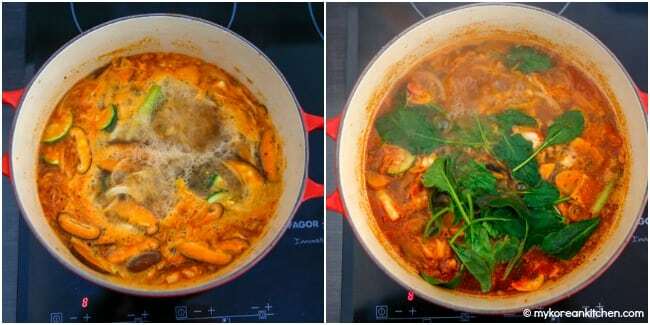 Generally the soup can be quite spicy but it can be toned down if you’re cooking it at home. In Korea, jjamppong’s popularity always competes with jajangmyeon (Korean black bean noodles, 자장면). If you can’t decide between jjamppong and jajangmyeon, then you can order jjamjjamyeon (짬짜면) instead. Jjjamjjamyeon is both types of noodle dishes served in a bowl that is divided in the middle. So you don’t have to compromise! While there are many theories about the origin story of jjamppong, the most convincing version is that it was created by Chinese immigrants back in the 1940s living in Nagasaki, Japan. Obviously the current jjamppong evolved much to suit Korean tastes. In particular, the addition of Korean chili flakes and seafood was introduced back in the 1960s in Korea. 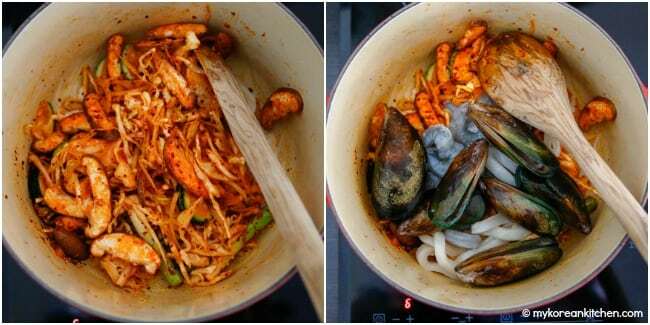 Today’s particular kind is spicy seafood noodles soup, which directly translates to Haemul Jjamppong (해물 짬뽕). It is also possible to serve the soup without the noodles. Just serve it with some steamed rice. This dish is then called Jjamppong Bap (짬뽕밥). One of the best things about making Jjampong at home is that you actually get to eat a decent amount of seafood. Typically a restaurant version doesn’t include much of it. If I’m lucky I would get 1 mussel and 1 shrimp! (No joke!) But my recipe provides a very generous amount of seafood and I think that makes a difference in the soup quality. Also, this spicy noodle soup is particularly suitable when the weather is a bit chilly or windy. It’s really hearty and comforting! So try it this weekend and let me know how you go! You are welcome to load the soup with even more seafood than what’s written below. It will bring out a more refreshing taste. Make sure the seafood is not overcooked as it can be chewy. For more complex flavor, some people add a small portion (about 100g / 3.5 ounces) of pork loin strips or pork belly strips. If you are going this path, add the meat before adding the seafood in step 2 below. Make sure you manage the heat well in step 1 below. 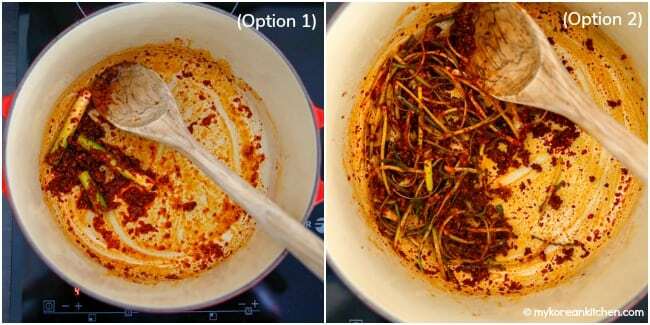 The oil is very easy to burn, particularly when the chili flakes are added. It can burn really quickly and darken the color if the temperature is too high. This can give you a bit of a bitter taste and dark colored soup. 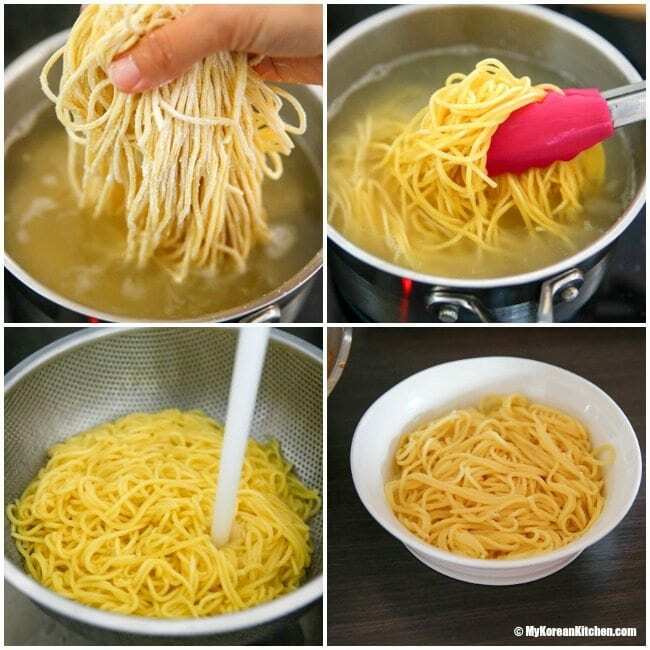 Once you serve the noodles with the soup, allow it to soak the flavor for 3 to 5 mins. 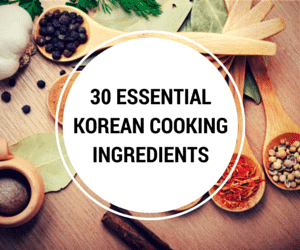 ** If you want to learn more about Korean ingredients, check my 30 essential Korean cooking ingredients list! 1. Preheat a wok (or large deep pot) on low heat until heated. Add the oil, Korean chili flakes, minced garlic, minced ginger and the green onion and stir constantly for a minute or two. Take care not to burn the chili paste as this can give a bitter taste. You can use the chopped green onions whole (option 1) or thinly shred them further (option 2). 2. Turn the heat up to medium and add the zucchini, mushrooms, cabbage, and onion. Cook them until lightly wilted (for 1 to 2 mins). Add the mussels, littleneck clams, prawns and squid (or baby octopus) and stir a bit. 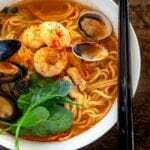 Korean spicy seafood noodle soup (Jjamppong or Jjampong) recipe. Preheat a wok (or large deep pot) on low heat until heated. Add the oil, Korean chili flakes, minced garlic, minced ginger and the green onion and stir constantly for a minute or two. Take care not to burn the chili paste as this can give a bitter taste. Turn the heat up to medium and add the zucchini, mushrooms, cabbage, and onion. Cook them until lightly wilted (for 1 to 2 mins). Add the mussels, littleneck clams, prawns and squid (or baby octopus) and stir a bit. PREVIOUS: Ultimate Bibimbap Sauce, 4 Ways! Yum! I will definitely need to try it soon ..
1. Heat up the oil in a pan. 2. Add minced garlic, minced ginger, and scallions. 3. Saute the garlic, releasing the aroma. 4. Turn down the heat. Saute the mixture on low heat. Add the cabbage, onion, and zucchini. Coat the veggies with gochugaru paste. Transfer everything into a large pot with boiling dashi stock. Thanks for an excellent (and very detailed) recipe. Just made it, and have a couple of questions. What is the best way to make the chili paste (gochugaru), and how is it different from gochujang? I used grape oil, and I think there’s just a little more oil floating on top than I’d like. Also, what is the best way to moderate the spiciness (heat)? Is it possible to add more chili paste to the bowl? And, kinda curios. Why would you use Mirin instead of Plain-Jane rice wine? Mirin is usually a bit sweeter than you garden variety rice cooking wine, isn’t it? Anyhoo, thanks a bunch for this recipe. Came fairly decent for a first time out. (Note to self. Next time, buy fresh shiitake, and correct kelp [Dashi Kombu]). The Korean spicy seafood noodle soup was just yummy. First time cooked Korean food and its delicious will try more recipes from your site. Not a big fan of seafood, but this looks really good. Will give it a shot. yummy, yummy, yummy I’ll have JJAMPPONG in my tummy and it sure sounds good to me. Very complex but yummy looking. I have to say I have never bought clams, but get the feeling it is essential for this recipe. A great soup without the usual sugar common in Korean food. Love it. 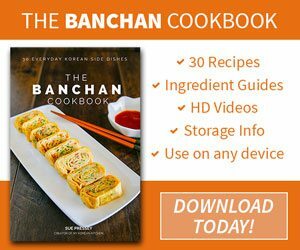 Is it possible to make Kimchi at home? I am in South Africa and was told that it is too hot here and I would only be able to make it in winter. Hi Michele, Many people make kimchi at home. If you’re making it in very hot & humid weather condition, don’t leave out kimchi at room temperature for too long (soon after making it). As this can age the kimchi too fast. If it helps, my Singaporean readers make kimchi all the time and they send me some pictures. They say their weather is hot and humid all year around. Are you able to give approx how much veggies to use like half a onion instead of grams I do not have a scale 🙁 thank you! I didn’t grab the right rice wine I used Makgeoli inside of mirin. I’m waiting for it to finish. I hope I didn’t mess it up. I have been on your site for 2 hours now and have saved so many recipes! Ill be trying your tuna cakes and a potato side dish tomorrow night and I can’t wait! Thanks for writing such an inviting and delicious looking blog! This soup looks fantastic and is on my to do list, with rice intead of noodles. Thank you for sharing, Sue! I just made these yesterday! It’s perfect for cold wintery weather. 🙂 Enjoy! This seems like a delicious recipie, but I am a non-alcoholic and mirin has small traces of alcohol (even the non-alcoholic ones). Do you know any substitutions? I can only think of alcoholic substitutes, such as sake or Chinese rice wine. Though in my quick google search, some people suggested high quality grape juice or apple cider. I think, you will have to experiment with these. Or omit it completely – though, I think it’s important to add mirin since there’s so much seafood in it. 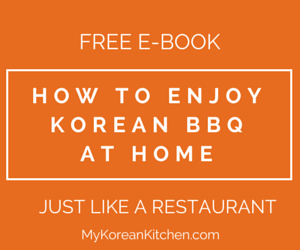 Great… now I see how to cook Korean dishes… thanks. I Love seafood, it’s probably my favourite thing to eat. And this… it looks absolutely delicious!